The Landau Institute for Theoretical Physics was created in 1965 by a group of LD Landau's pupils. Very soon, it was widely recognized as one of the world's leading centers in theoretical physics. According to Science Magazine, the Institute in the eighties had the highest citation index among all the scientific organizations in the former Soviet Union. This collection of the best papers of the In… stitute reflects the development of the many directions in the exact sciences during the last 30 years. 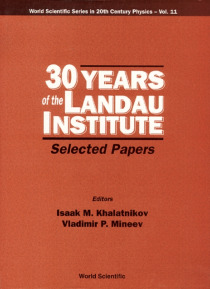 The reader can find the original formulations of well-known notions in condensed matter theory, quantum field theory, mathematical physics and astrophysics, which were introduced by members of the Landau Institute.The following are some of the achievements described in this book: monopoles (A Polyakov), instantons (A Belavin et al. ), weak crystallization (S Brazovskii), spin superfluidity (I Fomin), finite band potentials (S Novikov) and paraconductivity (A Larkin, L Aslamasov).